Is the Indian Ocean Rim Association looking to raise its profile? For the first time, leaders of the Indian Ocean Rim Association (IORA) are meeting in Jakarta, Indonesia, for a summit. The meeting began on March 5 and ended on March 7. IORA has 21 member states, including Australia, Bangladesh, Comoros, India, Indonesia, Iran, Kenya, Madagascar, Malaysia, Mauritius, Mozambique, Oman, Seychelles, Singapore, Somalia, South Africa, Sri Lanka, Tanzania, Thailand, UAE, and Yemen. The theme of this year’s conference is “Strengthening Maritime Cooperation for a Peaceful, Stable and Prosperous Indian Ocean.” Among the leaders in attendance are Sri Lankan President Maithripala Sirisena, Australian Prime Minister Malcolm Turnbull, South African President Jacob Zuma, Indonesian President Joko “Jokowi” Widodo (the host), Bangladeshi Prime Minister Sheikh Hasina, and Malaysian Prime Minister Najib Razak. Other states sent high-level representation, including India, which sent its vice president, Hamid Ansari. So, what is IORA and what did the leaders achieve in Jakarta? The decision this year to stage a high-level summit in Jakarta has no doubt raised the organization’s prominence. With heads of state and government in attendance, IORA 2017 drew attention to a range of issues of regional interest in the greater Indian Ocean region, including maritime security, fisheries management, disaster relief and humanitarian assistance, people-to-people exchanges, trade and investment, and tourism. We have just concluded the first IORA Summit. The meeting went well in a productive and constructive manner. 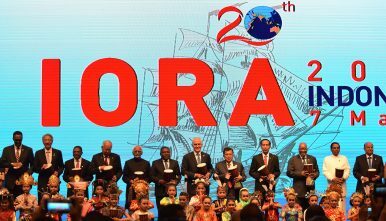 In addition to commemorating the 20th anniversary of IORA, the convening of the Summit is a strategic and progressive step by IORA Leaders to realize an IORA that is able to move faster, able to face the current situation, and able to deal with future challenges. The current Summit is also a milestone in the renewal of commitment by IORA countries to intensify IORA cooperation. The 21 member states issued a strategic vision document, known as the Jakarta Concord, that “sets out a vision for a revitalized and sustainable regional architecture,” according to a statement from the IORA secretariat. The concord builds on a ministerial meeting earlier in March, which resulted in an action plan document setting out numerous initiatives for the organization in addition to the adoption of a Declaration on Preventing and Countering Terrorism and Violent Extremism. With its 2017 summit, IORA looks poised to raise its profile as a deliberative forum in the region. The first-ever leaders’ summit has infused the two-decade-old forum with purpose. The question now is whether its 21 member states will be able to sustain momentum.